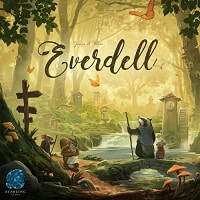 Everdell - Within the charming valley of Everdell, beneath the boughs of towering trees, among meandering streams and mossy hollows, a civilization of forest critters is thriving and expanding. From Everfrost to Bellsong, many a year have come and gone, but the time has come for new territories to be settled and new cities established. You will be the leader of a group of critters intent on just such a task. There are buildings to construct, lively characters to meet, events to host—you have a busy year ahead of yourself. Will the sun shine brightest on your city before the winter moon rises? Everdell is a game of dynamic tableau building and worker placement. On their turn a player can take one of three actions: a) Place a Worker: Each player has a collection of Worker pieces. These are placed on the board locations, events, and on Destination cards. Workers perform various actions to further the development of a player's tableau: gathering resources, drawing cards, and taking other special actions. b) Play a Card: Each player is building and populating a city; a tableau of up to 15 Construction and Critter cards. There are five types of cards: Travelers, Production, Destination, Governance, and Prosperity. Cards generate resources (twigs, resin, pebbles, and berries), grant abilities, and ultimately score points. The interactions of the cards reveal numerous strategies and a near infinite variety of working cities.